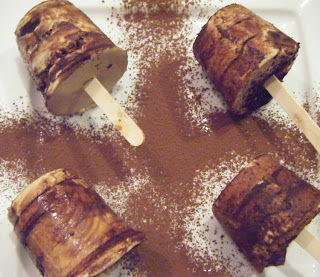 The other recipe I made was out of this month's Taste mag, it took my fancy as soon as I saw it, Tiramisu on a stick! 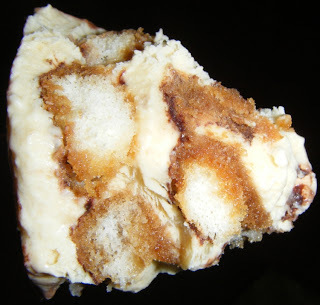 I have always loved Tiramisu, don't care if it is not very 'now'! I adore trifle and this is the coffee lovers version in my opinion, and now that I can easily get mascarpone I have made it several times. My usual recipe uses a ridiculous amount of eggs, 9 to be exact, but I usually try to scale it back to 6 eggs and adjust everything else accordingly. The usual recipe requires beating the egg yolks and sugar to make a zabaglione (traditionally done over a double boiler), beating the egg whites, cream and then mixing them all with mascarpone cheese and layering this mix with coffee dipped sponge fingers. This can be a bit of a pain, traditional trifle makes a custard and uses that to layer and I know that making custard is infinitely easier than the drama with the zabaglione etc. 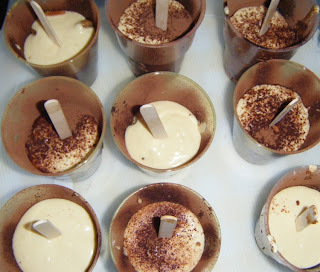 However, when you are feeding a crowd, I think Tiramisu looks and tastes so much more impressive, and is easy to make up in huge serving dishes. This recipe borrows from the traditional trifle by using custard instead of the zabaglione, however I just couldn't bring myself to buy prepared custard like the recipe asks for as I think it tastes plastic! I am ok with convenience when taste isn't drastically compromised! 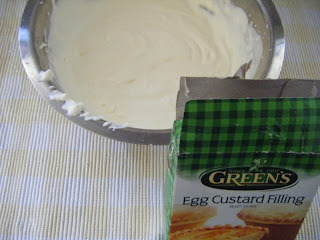 So I came up with the next best thing and used the box of Green's custard I got sent in my very first swap parcel from Nigella.com. I don't actually know who sent this to me, so if you want to identify yourself that would be nice as I could thank you properly! It worked perfectly! The process of layering the mix and spongefingers was a bit time consuming but fortunately my friend and her daughter had called in so I engaged their extra hands to make it go faster! These were pronounced very yummy by all who tasted. A novel dessert that can be prepared ahead of time and whipped out at the last minute! Just get them out of the freezer about 20 minutes before serving so they have softened enough to enjoy! This recipe made 10 large desserts, I would make them smaller next time as it was a little too large a serving! 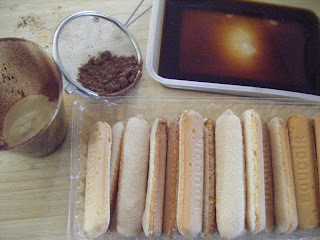 Put coffee and liqueur into shallow dish and dip sponge biscuits until just moist (need to still be dry inside). Set aside on a plate. Whip cream then gently fold it into custard. In another bowl whisk mascarpone with another shot of coffee then whisk custard mix in. Arrange 10 paper or plastic cups on the bench and dust inside with cocoa (I sprayed mine with cooking spray first so the cocoa would stick to the sides). Drop in a dollop of custard mix, crumble a bit of the sponge fingers over then dust with a layer of cocoa. 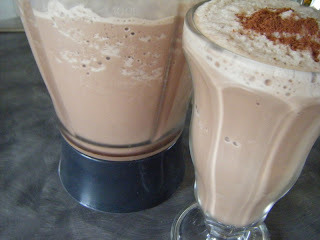 Repeat until cups are half full, smooth the top of the mix, add a final dusting of cocoa powder. Place an icecream stick in the middle of each cup and pop in the freezer preferably over night (I made mine in the morning and served them in the evening and they were perfect.) Take out and let 'ripen' for 20 mins before serving. Tip each icecream out of its cup before serving. So I experimented with how to make them at home. 2 blenders later I have perfected the mix. A blender that crushes ice well is essential (also serves up terrific margaritas and daiquiri slushies!) and I just make a chocolate syrup, add it to milk, some icecream and a tray of icecubes and blitz!!!! For the coffee version I add a shot of espresso sweetened with a tsp of sugar and the rest is the same. Sometimes I lash out and combine them both for a mocha version! They are an uplifting way to move through the heat.....today we topped the country with 33 degrees C! Those are adorable! And your frappes look really good, too. I've pretty much killed the blender I have now--it's still clinging on. But when summer rolls around, it'll be time to get a new one so I can try these! Neat idea! Everything is more fun on a stick! Oh my. Just came across this via Tastespotting--and yes, everything IS better on a stick! Now I am all excited about tiramisu again. Fabulously clever - I love it! I couldn't have imagine tiramisu being more perfect... but on a stick! Sign me up!